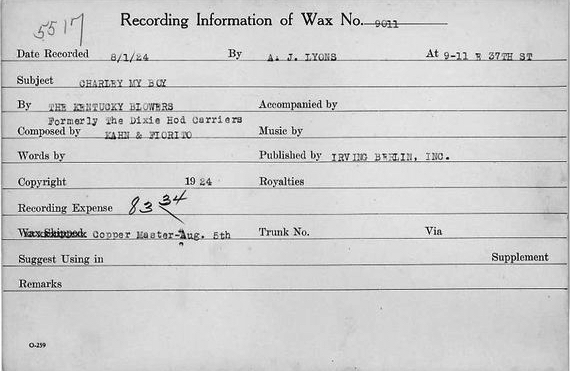 August 1st in Gennett History, 1924: The Kentucky Blowers with Roll Williams recorded “Charley, My Boy” in NYC. It appeared on Gennett 5517, Claxtonola 40352, and Starr-Gennett 9596. The recording also featured Bill Moore (c), Adrian Rollini (b.sax), Irving Brodsky (p), Tommy Felline (bjo), and Stan King (d). This entry was posted in August, Gennett and tagged Adrian Rollini, August, Bill Moore, Claxtonola 40352, Gennett, Gennett 5517, Gennett Discography, Gennett History, Gennett Records, Irving Brodsky, Kentucky Blowers, Roll Williams, Stan King, Starr-Gennett 9596, The Kentucky Blowers, Tommy Felline. Bookmark the permalink.